These 2 engines easily show me what the most cost effective flights are and what my options are to book these flights. Once I have established which flights I want to book, I compare the benefits of different booking engines to get the best savings on my flight. In the previous article in this series, I discussed the general things to consider that may lower the cost of your air travel. In this article, I’ll discuss the tools that I use to figure out the best flights as well as know where to make the bookings. In the next article, I’ll go through a few examples to quantify the savings. Using these 2 tools, you can establish the best flights for your particular journey, while easily testing out savings for various changes you might make to your itinerary including alternate airports, time of day differences in the price and changes in dates, among other things. The ITA Matrix Software is a tool powered by Google. The geniuses at Google have figured out how to display the flight information in a very user friendly way. I find that the ITA Matrix allows me to visually see all my options and make a very quick analysis as to which the costs and benefits of being flexible. You can’t actually purchase your ticket through the ITA Matrix. You will have to find another booking engine for that purpose. The ITA Matrix doesn’t even tell you where the flight can be purchased. I actually prefer this as it ensures that the software is not suggested flights for me that are more profitable, but is truly just showing me the prices. 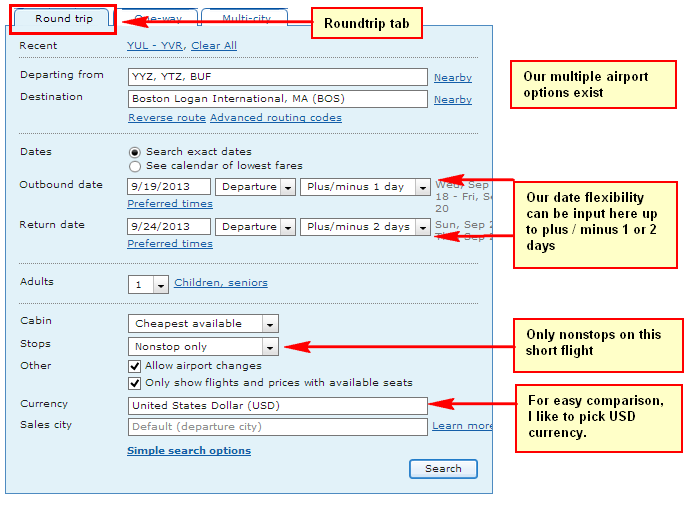 Ill go through a few examples of how to query the software for the flights you want and how to interpret the results. This is the most basic example where we will look for a simple A-B flight where we have limited flexibility in terms of dates and airports. Our only real flexibility is in terms of the time of day that we fly. From the results, we can see that the direct evening flight on Westjet is probably the best bet. There is no benefit to stopping over. If we wanted to fly on Air Canada instead, we know that it would cost us $436 for the cheapest Air Canada option instead of $362 for the Westjet option. The next option we will investigate is one where there is some flexibility around the exact travel days. From my articles on the best way to travel from Toronto to US destinations, we know that flying Buffalo to Boston is usually much cheaper than flying from Toronto to Boston. We will need to make sure to test that theory out on this trp. Also, if we fly from Buffalo, we will need to make sure that we give ourselves enough time to get to Buffalo from Toronto. We also need to make sure that if we are driving to Buffalo airport that we have a return trip back into Buffalo (instead of flying back into Toronto) otherwise our car will be stuck there. Another thing that I love about the Matrix is that if you are flexible enough to go where the airline wants to send you, the Matrix can tell you where to go. I have found some real cheap fares this way and knowing that if I position myself appropriately I can save a lot of money. In this situation, I use the nearby button to find all airports within a certain distance of my home airport and do the same for my destination airport. I also choose the calendar of lowest fares for travel for 12-19 days. You can then use the information that the matrix gives you and filter it to your needs. If the cheapest flight is a flight from New York to Paris, then you can look at the cost of a Toronto to Paris flight and see if the cost of getting from Toronto to New York by yourself is less than the cost of having the airline route you. A personal example of how I used this information acquired from the Matrix to save me money was when I went to India in 2012. I wanted to fly from Boston to Chennai and back. The flight I was going on routed me as BOS-JFK-DXB-MAA and back. This came out to a quoted price of $1350. Through my research on the Matrix, I was able to find that the exact same flights JFK-DXB-MAA came to $980 due to a promotion out of New York. 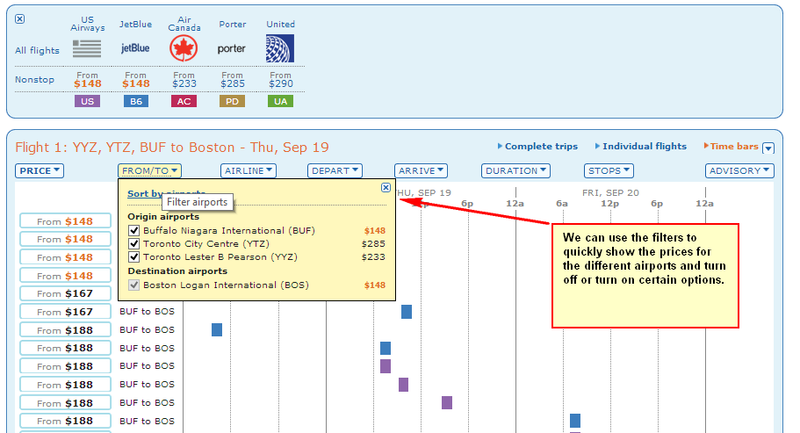 This meant that my flight BOS-JFK (Boston-New York) was pricing out as $370 for the roundtrip. A flight between Boston and New York should be less than $100 and I was able to actually get on a promotion where I paid only about $35 for a one-way flight between JFK and BOS (I arranged my plans to be in New York the day before we left). Cutting up my flight into its pieces saved me over $300 and I was not inconvenienced at all on the return as I was on the exact same flights I would have been on had I booked it all as a single journey. The other tool that is very valuable is Kayak. While the matrix is great for looking up flights and comparing them, Kayak actually offers you places to buy the flights. This is great because it gives you specific direction on where to go to book your flights. I also like that it forces you to basically confirm what ITA Matrix suggested. Sometimes the Matrix is wrong and this is a great way to confirm it. The other great thing about Kayak is that it makes suggestions on when the fare may go up or down. This is really only useful for domestic flights within North America, but still a very nice feature. Let’s take a look at our Montreal to Vancouver one-way flight that we used the Matrix for. 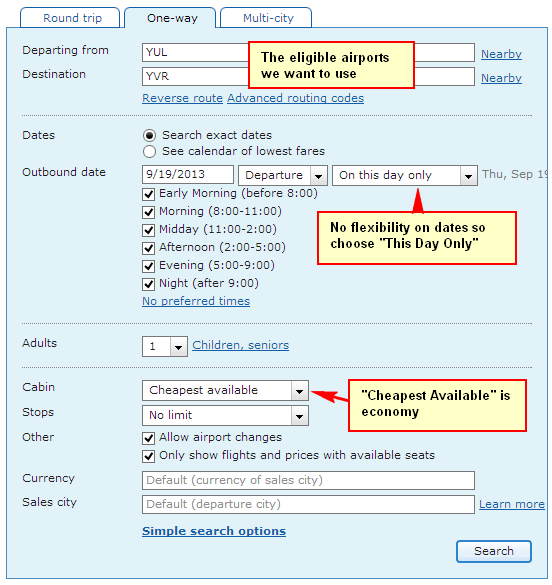 The Matrix suggested a direct flight on Westjet for $362. Let’s see if Kayak gives the same result and if it suggests where to buy this ticket. 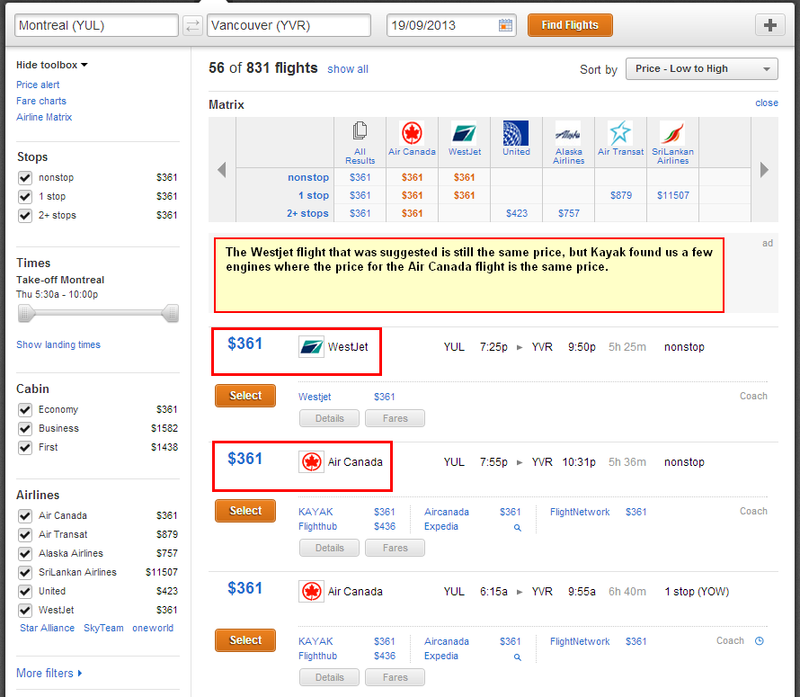 In this case, Kayak found a few engines that were selling the Air Canada ticket for the same price as the Westjet flight. (It also found an engine selling it for the price ITA Matrix suggested). It is always a good idea to check both sources. Based on the amounts I am going to get back as a rebate, I would want to either book this in USD on Cheap Tickets (assuming that the price is the same and I am not losing on the currency conversion). Let’s assume that I want to book in CAD. I would want to see if I can get this from CheapoAir.ca so I can get $5 in rebate. Fortunately, Kayak has a quick compare all button to check that for me. It turns out that CheapoAir is more expensive than what Kayak suggests. From here you have 2 options. You can book through CheapoAir and invoke the Best Price Guarantee and get $50 upon approval. Or you can just try Travelocity.ca using the same techniques. This way you can take your $2 rebate for the booking. In this article, I went over the techniques you can use to actually find the flights you want to book and where to book them. The ITA Matrix allows you many options and allows you to visually assess the best flights. There are many views and filters that help you assess all of your options. Kayak is great for finding the specific booking engine you should use and acts as a verification of what ITA Matrix suggests. 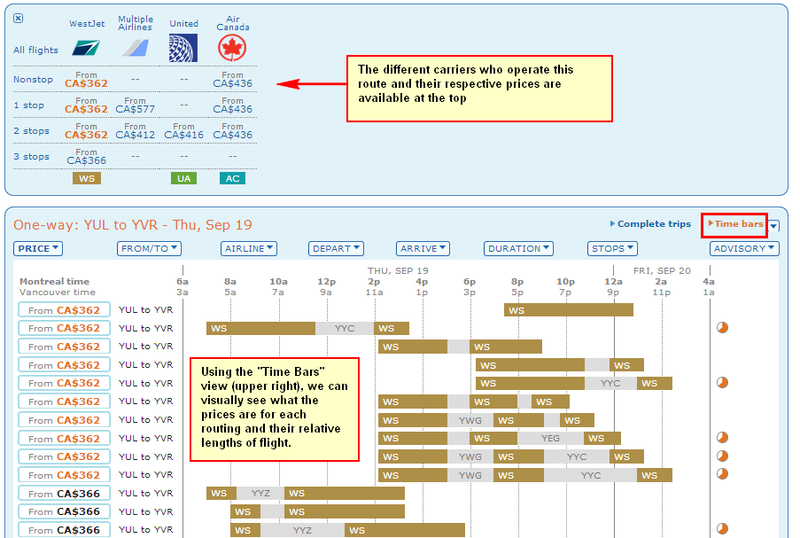 From Kayak, you can easily see the prices at multiple booking engines. You will want to choose your booking engine on a few factors, but a way to save money is to book through the engine that gives the biggest referral rebate. Sometimes the rebate is a percentage of the transaction (Cheap Tickets offers 4% return in USD if linked from the Top Cash Back portal). Sometimes it is a flat return per booking. Again, a very nice post! Question: Do you ever use the “confidence level” on Kayak? 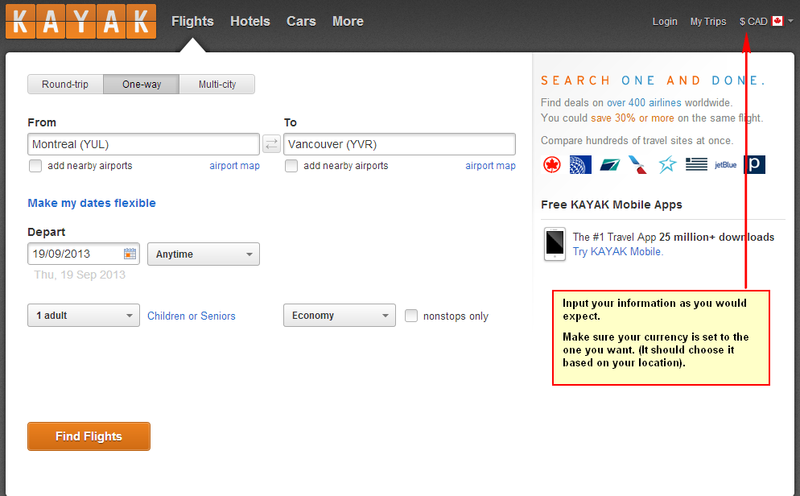 How reliable is it if Kayak says Wait with 79% confidence on flight prices? I actually find it is valuable. I am aware of the prices on the routes that I fly, so I tend to ignore it most of the time but I would listen to Kayak if it suggests waiting. I think Kayak uses good analytics to figure out the prices regularly for popular routes. As I mention, in North America, it tends to be pretty good about suggestions, but for overseas flights, it tends to not have a lot of data and is thus less reliable. Don't subscribe All Replies to my comments Notify me of followup comments via e-mail. 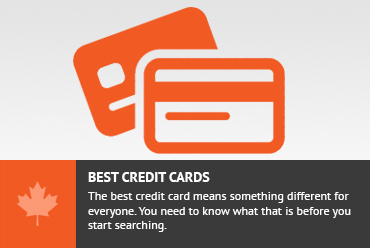 You can also <a href='https://www.creditwalk.ca/comment-subscriptions/?srp=1163&srk=2648578ecea05c83754707575dc5a494&sra=s&srsrc=f'>subscribe</a> without commenting.